This article will help you prepare for taking the Praxis® II Family and Consumer Sciences (5122) exam. You’ll find registration details, important reminders for exam day, areas of covered content and more to prepare you for success. 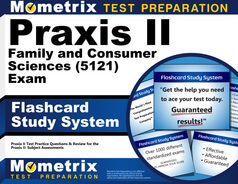 The Praxis® II Family and Consumer Sciences (5122) exam assesses your readiness to teach a family and consumer sciences curriculum in middle school or high school. Since the curriculum is often broad and can cover a variety of topics, the test has also been designed to represent that, as well. The exam fee is $120 payable at registration. Acceptable forms of payment include a check from a U.S. bank, money order, PayPalTM, eCheck, VISA®, Discover®, JCB®, American Express® or MasterCard®. You’ll receive time and location details when you complete your registration. Test Duration: The testing period is two hours. A form of Identification, showing your name, signature and photo (such as a passport, a driver’s license, state/province ID, national ID or military ID). Format/Number of Questions: This computer-delivered test has 120 selected-response questions. Here are categories covered during the test, including the approximate weight each category has as part of the overall exam and the estimated number of text questions. Category 1: Food and Nutrition (22% with About 26 Questions) — Includes disciplines such as sanitation, food safety, farm-to-table background, food contamination, food science, food preservation methods, meal planning and presentation, culinary acumen, recipe adjustments, environmental impacts and general hospitality industry knowledge. Also covers wellness and nutrition subjects such as biochemical processes, nutrient sources, dietary standards, food nutrition, impacts of technology, the economy, science and the environment on production, nutrition interpretation, and healthy choice maintenance. Category 2: Housing and Interior Design (12% with About 14 Questions) — Looks at ways the modern design landscape has been affected by past design approaches, the application of design preferences and approaches, life span housing needs, housing material environmental impacts, housing characteristics and housing choice factors. Category 3: Textiles, Fashion and Apparel (12% with About 14 Questions) —Assesses safety guidelines and ethics, basic techniques, tools and equipment, fashion/design history, material characteristics, evaluation methods, psychological factors in clothing choices, design principles, wardrobe maintenance, customer satisfaction and career success concepts. Category 4: Human Development and Interpersonal Relationships (20% with About 24 Questions) — Looks at ideas related to relationships and families, including professional, family, community and interpersonal factors through life, relationship functions, ways of strengthening relationships, parenting styles and impacts, ideas for handling times of crisis, conflict and change, family historical principles, social and public policies, the family life cycle and external support systems. Also covers early childhood and development areas such as emotional, moral, cognitive, social and physical development through life, factors affecting development growth, development stage monitoring, ethical standards for caregiving, age-appropriate curriculum development, early childhood language principles and educational program management. Category 5: Foundations of Family and Consumer Sciences Education (16% with About 20 Questions) — Covers topics such as family and consumer science education ethics, politics and economics, educational resources, FCCLA organization principles, the application of core educational guidelines in the curriculum, student-centric learning and career ethics. Category 6: Resource Management (18% with About 22 Questions) — Covers financial literacy elements such as the factors that affect family resources, financial literacy and its impact on life, financial management problem solving and decision making, financial information interpretation, financial institution resources, policies and laws, resource evaluation and technological impacts on finances. Also covers a range of consumer and career education concepts including family and individual resource selection and management, decisions and impacts, rights and responsibilities, government policies and regulations, product quality, career planning, skills for success in various life settings, and evaluation and awareness of other community, workforce and family resources. Calculating Your Passing Score: The passing score varies by association, institution, and state. Each entity sets their own passing score thresholds. Learn more at www.ets.org/praxis/states. You have other resources available to you from Mometrix Academy. For a fee, you can access our information-packed Praxis Study Guide, including videos and other exam preparation details. And, you’ll also be able to use a set of flashcards to boost recall and prepare for success. Mometrix Academy is a completely free resource provided by Mometrix Test Preparation. If you find benefit from our efforts here, check out our premium quality Praxis II Family and Consumer Sciences (5122) study guide to take your studying to the next level. Just click the Praxis II Family and Consumer Sciences (5122) study guide link below. Your purchase also helps us make even more great, free content for test-takers.